The Godess Mut was a fierce defender of Egypt and had a human and a feline form. And she was known also as protective mother. The main Mut temple is surrounded on three sides by a sacred lake, called the Isheru, and they found many statues of Sekmet there. Isheru (belonging to the lady of the ashru, asher) is a term used to describe sacred lakes specific to precincts of goddesses who can be leonine in form. 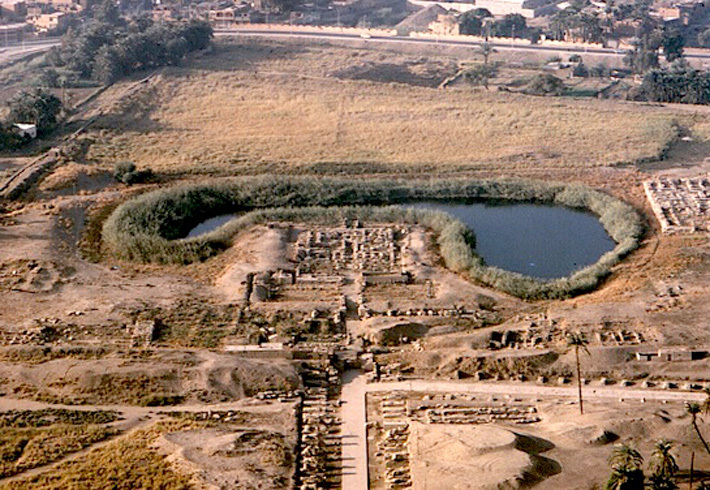 The Mut Precinct's Isheru, is fed by an underground spring, and is the largest in Egypt that is preserved. But the mainstream egyptology is saying that the lake of Mut temple is moon shaped only because Mut was the mother of Khonsu, who was associated with the moon and this despite absoluetly no evidence in ancient texts or inscriptions of a « moon shaped lake ». And of course I can't agree with this point of view… because for me the lake is shaped exactly as the Akhet hieroglyphic sign, and the temple is built right on the place of the sun position in akhet which is the best place for a temple celebrating the divine birth of a god,in this case Khonsu, son of Amun and Mut, and of the Pharaoh himself. If you rotate the pic to get it reverse you get exactly the Akhet sign (the left part of the so called moon is smaller because it has dried, you can see the ancient edge). Also the Ancient Egyptians used to see the maps the South up and North down in the pic I show you the lake is in the North of the temple, if you reverse the pic, the Akhet sign is in a perfect position. Akhet : the Sun between the two mounds represented the 1st day of the first month of the rising of the Nile the cause of the fertility of Egypt, the sacred Horizon and in the temple that day they use to do celebration with lights and offerings to the Sun god Ra and it was a new birth for the temple and everybody.